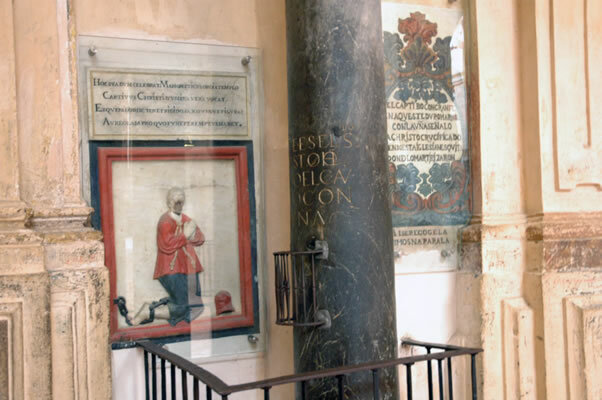 This column was at some point carved with a 17-cm crucifix, which was said to have been carved by a Christian captive with very hard fingernails. The plaque and rail were added in the 17th century. However, it would have been totally against the dictates of the Moslem faith for a Christian captive to be held or executed in a Mosque, so we may discard this legend outright as a misguided fiction. Nevertheless, the column could very well have been used at another location before it was used in the Mosque for Almanzor's expansion. In addition to the inscription, there are the remains of what appeared to be a chain embedded in the column. In Spain during the middle ages, slavery was common among people of both faiths. In the 9th century, there was a brief movement led by St Eulogio in response to the growing islamization of Cordoba. Several Christians caused their own execution by breaking the law, entering the Mosque and publicly condemning Islam. Historical memory of these isolated events probably inspired beliefs surrounding this inscription many centuries later. Interestingly enough, there are historical references to similar inscriptions made both in Moorish Ronda and in the prisons of the Inquisition. In the 21st-century, men and women of all faiths should discard the 17th-century particulars and see this column in a universal light, as a memory of sufferings caused by war, captivity, slavery and fanaticism, which is not the heritage of any one religion or nationality.